Clasp/Buckle: Stainless steel Rolex deployant clasp stamped "OP12" and "78790A"
The present wristwatch is an example from the legendary Explorer II SSR limited edition. The British Special Reconnaissance Regiment was instituted by the United Kingdom in 2005 to provide the Queen and other sensitive targets with increased protection, especially against acts of terrorism. 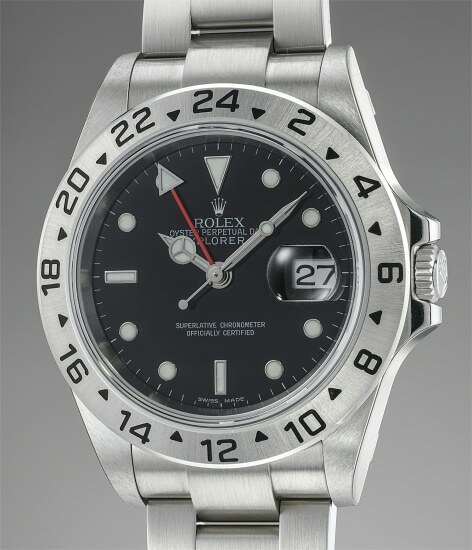 Possibly to mark the creation of the Regiment, two Rolex models - a Submariner 116610, and the present Explorer II - were made in limited editions with engraved back for the SRR. These two models might be the only instances of Rolex military timepieces being part of a numbered limited edition. In fact, the watch bears a caseback with the bas-relief of the crest of a regiment in the center and an additional light engraving close to the rim reading SSR and the limited edition number. Other military timepieces are known to have been made in exceedingly small series such as the “Polipetto” Sea-Dweller for the Italian State Police, known to have been made in 78 examples - see lot 15- but not one of them feature watches with numbered cases. Furthermore, a limited edition Certificate issued jointly by the SRR and Rolex certify the limited edition and the number of the piece. Such an amount of details regarding the limited edition is indeed extremely unusual for a military timepiece and leaves little doubt that the one who commissioned the series was a serious watch enthusiast. The icing on the cake for the collector of military timepieces is the condition the watch comes in: absolutely as new and still bearing the factory stickers. Needless to say, this is an occurrence which may take a very long time to happen again at public auction: collectors are warned.